One of our readers, Kristina, from Port Stanley sent us this report of her first sighting of this year's Tundra Swans - We live near Port Stanley, Ontario, near Hawk Cliff, and we just saw our first flock of Tundra Swans fly over the house today! They were flying west towards Port Stanley. Comments for Our first sighting this year! 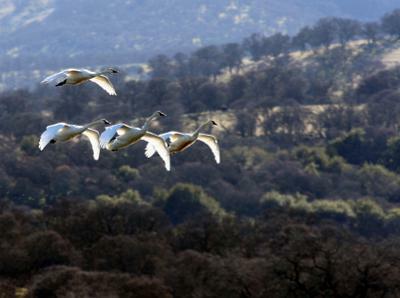 The Swans are beautiful - we are so lucky to have them passing through this area.